Ever since John Nash built the Prince Regent his extravagant Pavilion, Brighton has attracted architects seeking to push the boundaries of their craft. This has now been recognised in a new tour of the city’s landmark buildings which has been launched for 2013. Joining the well known Pavilion, Pier and the Regency splendour of Kemp Town are a collection of landmark twentieth century buildings. 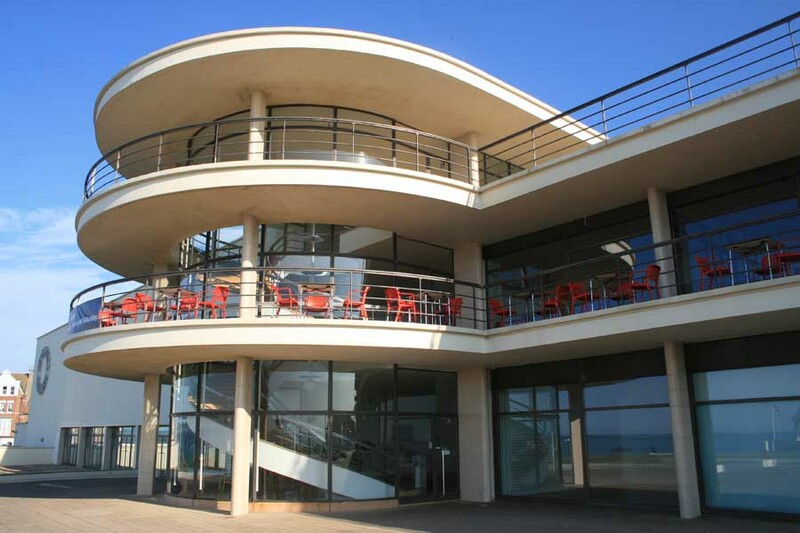 The tour begins at Saltdean on the eastern fringes of the city with the Grand Ocean building and the Saltdean Lido both designed by RWH Jones in 1938. The restored art deco Grand Ocean was formerly the Grand Hotel and is now converted to luxury apartments. Also included in the new tour are lesser-known but nonetheless important buildings in the history of the town and of architectural development since the Regency heyday of Brighton. The brooding presence of Rodean School designed by JW Simpson in 1899, William Glen’s 1930 Savoy Cinema, the original 18th century merchant houses of Ship Street and Wells Coates’ early modernist masterpiece, Embassy Court are all included on the new tour. The tour ends in Hove with the virtually unknown Barford Court at 157 Kingsway. An idiosyncratic Thirties villa built between 1934-7 by Robert Cromie for a northern steel tycoon. This new tour takes you from Saltdean, across the city to the western area of Hove. It primarily looks at the city’s 20th century architectural legacy interspersed with some of more famous buildings from earlier periods. Grand Ocean 1938 RWH Jones Moderne style designed as a luxury hotel for the charges of a moderate hotel; a symmetrical fan-shape. Taken over by Butlins in 1953 before its 21st century redevelopment into luxury apartments. Saltdean Lido 1938 RWH Jones A similar design, a style reflecting the Thirties love of the streamline, and here the aeroplane, with curving wings and prominent central projection reflecting Bexhill’s De la Warr pavilion. Roedean. Built in 1899 by JW Simpson in free Jacobean style an ambitious scheme combining educational and residential areas under one roof. This building replaced the earlier location of the school from nearby Kemp Town. Marine Gate by Wimperis, Simpson & Guthrie, overlooking the Channel it has a nautical air with its port-hole windows. Kemp Town, a spacious layout of large family homes that took 30 years from its inception before it achieved its present fame, leaving Kemp a bankrupt. The original appearance was as today, as the builders only erected the façade, with the purchasers having the house built behind! The Van Allen Building 1999 by PRC Fewster, reflecting the Thirties architectural feel seen earlier; it has the curvilinear outline and stepped appearance of the Modernists. Brighton [Palace] pier by R.St.George Moore, but heavily altered since. It is all that the seaside should be, fun and frolicsome, offering wonderful views of the Brighton & Hove coastline and extensive sea views. The history trail along the pier is worth following, look out for the old wrought and cast ironwork of the 19thcentury pier. At this point it is possible to take a short detour away from the coast, inland to the Royal Pavilion estate and the Old Town. The Royal Pavilion; originally a town fringe farmhouse, it evolved into the Marine Pavilion, of George ,Prince of Wales; an elegant, classically designed house, which by the 1820s had been transformed into the exotic Indian/Moorish influence palace of today. 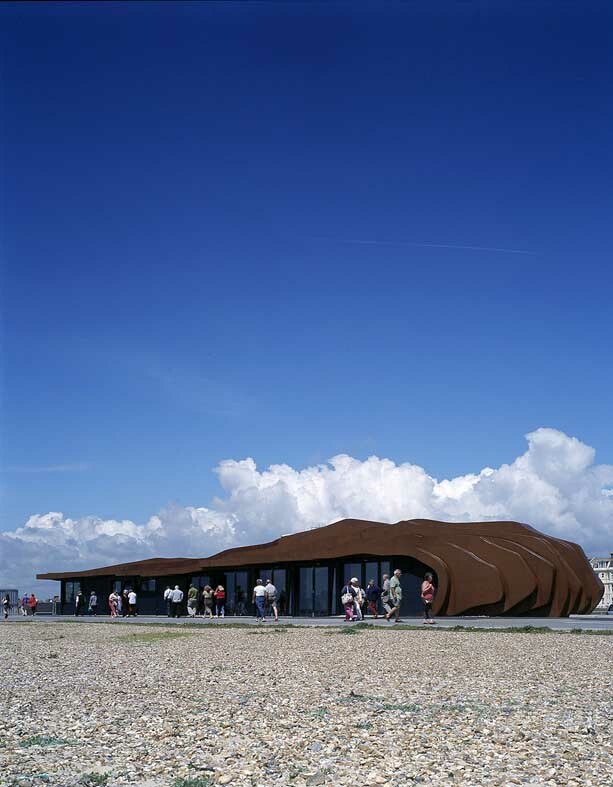 Its exuberant form has seeped out to many of the city’s buildings especially those along the prom and pier. Nearby in Ship St. is the location of the 18th century resort’s merchants, substantial houses, many with bow fronts, Mathematical Tiles, local honey coloured brick and a variety of local flint work – from field and beach, cut, knapped, and boulder flints; many with fine doorways. Hotel du Vin at southern end is a glorious 1928 example of ‘Brewers Tudor’ by Ernest Barrow- jettied storeys, patterned brick, stained glass, carved oak beams and a portcullis. Back on the coast road the way westward to Hove has Brighton’s usual 19th century collection of architecture with some blots of 20th century ‘leisure’! Three hotels stand out. The Grand Hotel by JWH Whichcord cost £57,000 in 1864; Italianate style of eight storeys, when opened it was the tallest structure in Europe and needed water powered lifts to enable access to the upper floors. Infamously bombed by the IRA in 1984 the rebuild has restored the Victorian swagger. The Norfolk Hotel of 1865 by Horatio Goulty. Frothily Victorian, in imitation of grand London railway hotels, it forms the West End of resort Brighton. Embassy Court 1935 by the Canadian architect Wells Coates; an example of early modernism, concrete framing, long unbroken bands of concrete between the windows and as balcony parapets. Twelve storeys, with the top floor set back and the curved south east corner it has all the features associated with the Modern Movement. Brunswick Town, Hove; built from 1823 and one of the finest examples of Regency building anywhere; its uniform colour dictated by a 19th century Act of Parliament. This was the first of the major 19th century schemes to be promoted as family homes rather than as seasonal resort housing. It housed some of the greatest and good…and wealthiest, in the area. Adelaide Crescent of 1830 with its northern extension into Palmeira Square of 1850. Two disparate projects that have melded into one fine example of 19th century urban – and urbane- living. 4 Grand Avenue 1938 by Murrell & Piggott a large apartment block with exposed brickwork Deco curved balconies, bas-relief ornamentations and Crittall windows. Viceroy Lodge 1936, a severely Moderne angular luxury brick seafront block, with a sun balcony for every flat, which also had ‘refrigerators and wireless points’. Barford Court, 157 Kingsway, idiosyncratic Thirties built between1934-7 by Robert Cromie for a northern steel tycoon. Cromie was a cinema designer and Barford Court has all the style and panache of an interwar picture palace, both inside and out.